Brand new apartment just renovated, obtained from the ground floor of an old rural house that dates back to 1400. The conservative restoration has allowed to highlight and enhance the game of vaulted ceilings that make the house truly evocative. The choice of materials has been carried out with great criteria and the furniture is the result of a life of research of particular things and of a great passion for travel. A bedroom with 1 double bed and in case of need you can add a baby bed. A relaxation area equipped with a sofa that, if necessary, is divided into two comfortable cm beds. 80 x 200. A bathroom with a window where there are a sink, a toilet, a bidet, a hairdryer and a nice shower. An area with a built-in wardrobe. The kitchen is equipped with a hob, fridge, sink, microwave and water kettle, toaster and pots. The dining area consists of an oval table, chairs and a sideboard containing all the dishes. Sheets, blankets, towels, tea towels and place mats are provided. The apartment is located on the ground floor and the entrance leads to the garden with an area to have lunch and relax. (photos soon). In the building there is a rustic cellar where bicycles can be stored. Outside the water pump is available where you can wash your bikes. 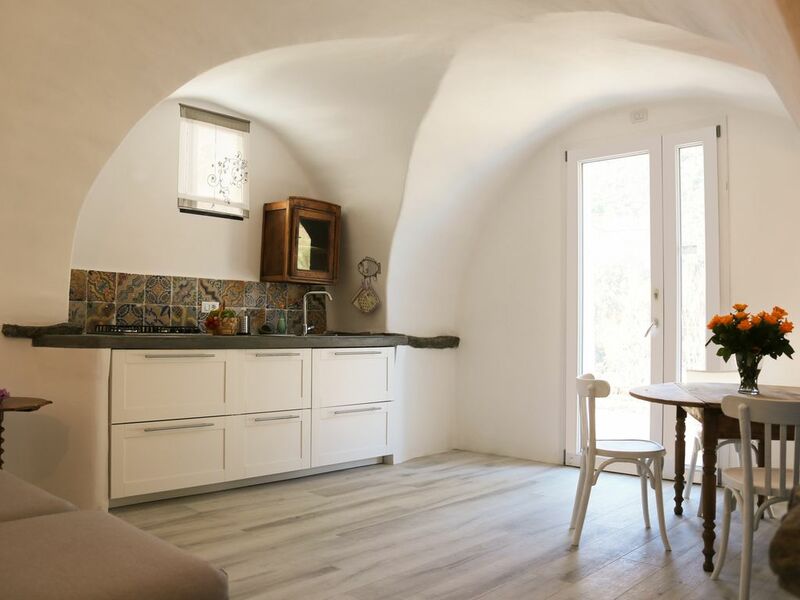 The house is surrounded by centuries-old olive trees and typical vineyards. The land around is still cultivated as a vegetable garden and orchard. The place is ideal for relaxing stays and for walks in the chestnut woods, where in the right season it is easy to find porcini mushrooms. Nearby there are water courses with natural pools and waterfalls. For those who love cycling it is possible to make very beautiful routes starting directly from the front door. We are located in the heart of the most beautiful mountain bike trails and Down Hill. Climbing crags can be reached in a very short time. Looking out of the window at dusk, it is not rare to see severe animals. The apartment has heating at a cost of € 40 per week. ONLY ONE CAR PLACE is available. For those with more than one car, leave it at the end of the road. Die schönste Urlaubswohnung, die wir je hatten. Mit einem wunderbaren Rosengarten und ruhig gelegen. Die Wohnungen sind geschmackvoll eingerichtet und gepflegt. Frau Battaini ist sehr freundlich und hilfsbereit. (Noch einmal danke an dieser Stelle). Die Nähe zu vielen Ausflugsorten und auch zum Meer war für uns besonders angenehm. Take the A10 motorway and exit at Finale Ligure. Follow the direction to Calice Ligure. From the town center turn right for Carbuta, after 3 Km. On the left follow the indication for Canto Di Sotto. The house is located in an area renowned for its good typical cuisine. Cozy restaurants are scattered around.